Among the important figures in the history of Mitsubishi is a remarkable Scotsman. Thomas Blake Glover came to Japan in 1859 to manage the newly established Nagasaki office of a British trading house. He later participated in establishing businesses that would became pillars of Mitsubishi's early growth and diversification. Glover was born the son of a coast guard officer in 1838 and grew up in the port city of Aberdeen, Scotland. He joined Jardine, Matheson & Co. on finishing school and worked briefly in the company's Shanghai office before taking up his assignment in Japan. Nagasaki, Japan's only international port from 1639 to 1859 under the isolationist policies of the Tokugawa Shogunate, was a thriving entrepot. Glover soon built a bustling business there, largely in exporting tea. A larger business opportunity emerged with rising tensions between the Shogunate and rebellious clans in southern Japan. Glover made a fortune selling ships and arms to the rival factions. Demand for coal surged as steamships multiplied in Japanese waters. Glover, in partnership with the Hizen Clan, invested in developing the Takashima coal mine on an island near Nagasaki in 1868. Their mine was the first in Japan to employ Western methods of mining. Financial troubles later forced Glover to sell his stake, but he stayed on as manager of the mine for several more years. Mitsubishi acquired the mine in 1881 in the organization's first main diversification beyond shipping. Another enterprise Glover played a role in that later became part of Mitsubishi is the Nagasaki Shipyard. Japan lacked modern facilities for repairing ships. So, Glover imported the necessary equipment for a slip dock in Nagasaki in 1868. He later sold his share to the government, which leased the dock to Mitsubishi as part of the shipyard in 1884. 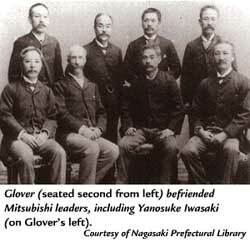 Glover forged lasting friendships with Mitsubishi founder Yataro Iwasaki and with Yataro's brother, Yanosuke, the organization's second president. The elder Iwasaki represented the Tosa clan in Nagasaki. He was in the market for ships and armaments for his clan. And Glover was the premier broker of those items in Nagasaki. Yataro turned frequently to his foreign friend for support and advice as Mitsubishi grew. Glover's knowledge and understanding of international business was invaluable to Mitsubishi, where he was an advisor for 40 years. Glover thus contributed immensely to the industrialization and modernization of Japan. Emperor Meiji recognized that contribution by naming the Scotsman to the Order of the Rising Sun in 1908. Some of the industry that Glover fostered in Japan continues to quench the thirsts of grateful beer drinkers. He joined a group of investors, which also included Yanosuke Iwasaki, that took over the defunct Spring Valley Brewery in Yokohama in 1885. They established Japan Brewery Company, which later became Kirin Brewery. Glover died in 1911 in Tokyo. His Nagasaki mansion, which local tradition identifies as the setting of Madame Butterfly, is a tourist attraction today. Mitsubishi Heavy Industries donated the mansion to the city in 1957. In further homage, the company acquired the Glover family home in Scotland and donated it to the Grampian-Japan Trust, a natural and historical preservation society. Documentary about the Scot who did so much to help Japan become the technological powerhouse that it is. I'm not saying that makes him worthy, but it's an interesting story. A BBC Scotland production.